Like Gable, PPG Industries prides itself in collaboration, innovation and creativity. In October 2016, PPG reached an agreement with the National Hockey League’s Pittsburgh Penguins to assume naming rights for Pittsburgh’s multipurpose arena. Previously known as “CONSOL Energy Center,” the arena was immediately named PPG Paints Arena, after PPG’s paint products. Gable knew the arena well since it had installed the arena’s first exterior identifying signage for CONSOL Energy prior to the arena’s 2010 opening. When PPG, a Pittsburgh-based coatings company, assumed naming rights of the arena in late 2016, the 130-year-old brand immediately replaced signage with “PPG Paints Arena” banners in windows around the arena. Seeking a permanent solution, PPG chose Gable to conceptualize, manufacture and install new exterior signage around the arena. Gable was excited to return to Pittsburgh for the interesting and important project. Gable delivered four brilliant, identifying signs for PPG Paints Arena, including a color-changing light concept for the signage on the arena’s west façade. 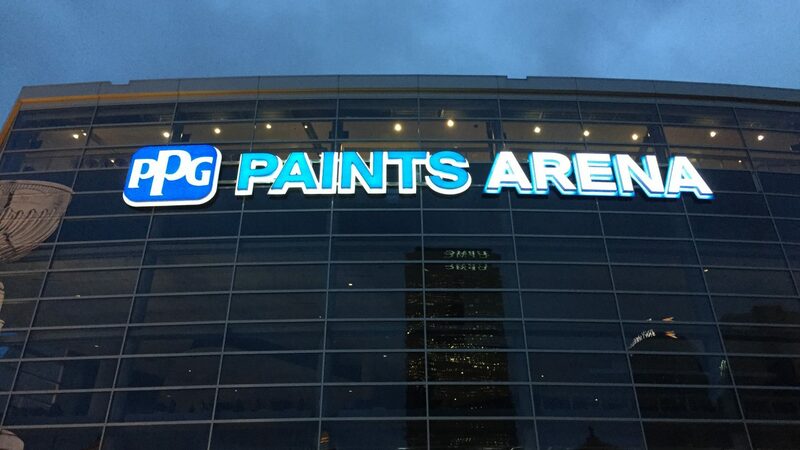 In all, four “PPG Paints Arena” signs were installed on the arena’s exterior, using face and halo illuminated channel letters. Gable conceptualized, fabricated and installed each sign, including a 24-foot wide by 3-foot tall sign on the north side, a 29-feet by 8-feet sign on the east side, and a 29-feet by 6-feet sign on the arena’s south side. The sign on the arena’s west façade, on its west side, measures 78.5-feet wide by 9.75 feet tall and features color-changing channel letters with full RGBW capabilities. Gable works closely with clients to learn their business and implement solutions that enhance their brand. Understanding that PPG Paints boasts a passion for color, Gable recommended a RGB lighting upgrade to the signage on the arena’s west façade. The results were amazing. The color-changing LED-lit signage has been a huge hit for the arena’s tenants, attracting attention from all over with an almost infinite amount of color combinations. 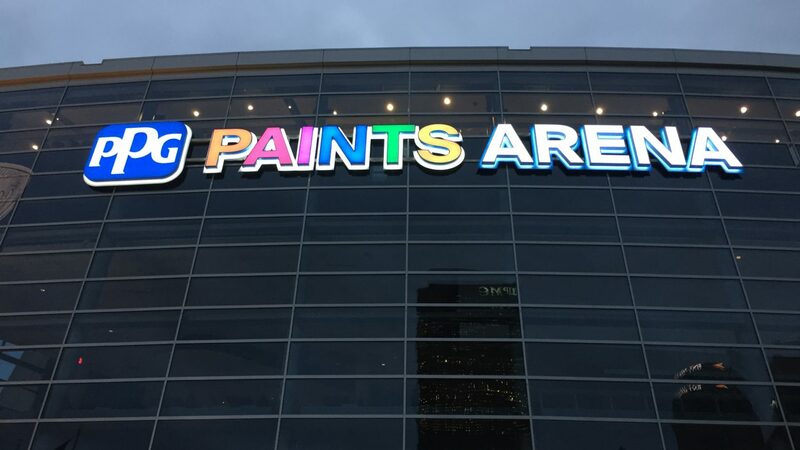 PPG Paints Arena’s new color-changing signage illustrates the company’s reputation as a world-class provider of quality paints and stains, illuminating its brand on the Pittsburgh skyline. The color-changing sign allows arena operators to change the color of “Paints” to commemorate holidays or other special occasions. At the start of the 2017 NHL Playoffs, “Paints” was lit up on the arena’s west façade in Penguins gold. Since opening in 2010, the arena has hosted more than 150 events each year, and each day the arena ’s new exterior signage is seen by thousands of people each day. As companies look to advance their brands with naming rights deals, they are securing valuable real estate to display their brand proudly, precisely what Gable excels at as a visual solutions provider. About PPG Paints: PPG (NYSE:PPG) works every day to develop and deliver the paints, coatings and materials that its customers have trusted for more than 130 years. Through dedication and creativity, PPG solves customers’ biggest challenges, collaborating closely to find the right path forward. With headquarters in Pittsburgh, PPG operates and innovates in more than 70 countries and reported net sales of $14.8 billion in 2016. PPG serves customers in construction, consumer products, industrial and transportation markets and aftermarkets. To learn more, visit www.ppg.com.